With one tweet, Elon Musk sent Wall Street into a frenzy: “Am considering taking Tesla private at $420. Funding secured.” According to Marketwatch, “The tweet was the Wall Street equivalent of yelling fire in a crowded theater when there isn’t even any smoke.” The stock shot up 8%. Then, Nasdaq halted all trading of Tesla shares. Trading resumed again and the stock closed up 11% leaving Tesla’s short sellers losing $1.3 billion in mark-to-market losses. Will Tesla Ever Overcome The Plethora Of Haters And Shorts? Earlier in the day, Financial Times reported, “Saudi Arabia’s sovereign wealth fund had taken a $2bn stake in the electric carmaker.” The Saudi fund approached Elon Musk about buying newly issued shares but it was reported that Tesla had declined. Instead, the Saudi fund quietly scooped up Tesla shares in secondary markets with the help of JP Morgan. Hmmm. The Wall Street Journal also weighed in: “One theory is that Mr. Musk is trying to flush out a strategic buyer with ready cash (Google or Apple? )” Don’t forget — in Ashley Vance’s biography on Musk, he writes that in 2013, Elon had “proposed that Google buy Tesla… [Larry] Page accepted the overall proposal and shook on the deal.” It never happened, but, could a similar deal be back on the table? In the past, Musk has been vocal about his preference that Tesla be a private company. He even told Rolling Stone last year, “I wish we could be private with Tesla… It actually makes us less efficient to be a public company.” That said, his latest comments have sent shock waves through Wall Street. 54 Comments on "How One Tweet From Tesla CEO Elon Musk May Change Everything"
The norwegians have over $1T in their SWF they don’t know what to do with . . .
Free Teslas for all 5M Norsefolk! That would actually be pretty cool. Norways always wanted a car company they nearly swapped oil for volvo when it was first found. The Think and the Buddy were a big part of the ev incentives starting. It would kind of round the circle and there would be a big investor happy to see the 35k arrive ahead of the monthly profits. I don’t think it will happen, as the argument for why its needed, the shorts are annoying, seems to be fading. Jim Chanos said that the shorts were the best thing about the Tesla story. I wouldn’t go that far but the shorts have actually helped Tesla in my view. Continuing with Chanos he went on to say that Tesla should be worried more about the coming competition, from BMW, Mercedes,, Audi. Yeah, right. Sad to say Jim still does not get it, his short position is fundamentally flawed due to his inability to understand that this will not be the case, that legacy auto will steal Tesla’s ev crown. May I ask how? Yes it is free advertising but very negative. The whole wall street desire for short term profit now versus long term success of the mission seems to be at odds to me. It puts pressure on the company to meet certain targets or to improve vehicles overall, in fit & finish and other shortcomings shorts claim the vehicle has. You have it backwards. The problems of fit and finish was caused by the excessive pressure to meet quarterly expectations. Quality does not go up when you are rushed. In US, Tesla is untouchable, but in Europe, people like BMW, MB, Audi, Jaguar, etc. over Tesla. If they have a choice, they will prefer those brands. In Asia, Tesla was strong, until 2 months ago (you know why). Now there is an opening for other luxury carmakers to replace Tesla as the premium BEV worldwide. This race is far far far from over. Please do not presume to put everyone in Europe in the same boat. People are people and many choose a purchase based on what is BEST for them, not on whether it it is a Euro or USA company. A lot of people in Europe, I include the UK in this even though we are not in Europe, are just as much Tesla supporters as many Americans are. I love Jags but would not buy a Jag EV, I, like many of us, WANT a Tesla model 3 and the sooner the better. The UK is certainly a part of Europe. No car maker is in the position to “replace” Tesla in the foreseeable future. The best they can hope for, is to slow Tesla’s erosion of other makers’ market shares. The Short Smear Campaign against Tesla really needs to stop. Tesla has lost more than $1 billion in six months, what is not to like? And you lost all credibility a long time ago. In what way? You are the one shooting your mouth off. They have had massive losses, THAT is a fact! And yet the book losses only tell half the story (or less). Here is why your fixation is flawed, short-sighted, and faulty analysis. 1) Tesla as accumulated assets at the same time they have produced book losses. Currently $28B in Total Assets vs. $22.5B in Total Liabilities. You fixate on operating losses, but ignore Asset accumulation (AKA Wealth) that has been produced. This is like confusing renting an apartment with making a mortgage payment and failing to account for home equity built. 2) Much of Tesla’s operating losses are related to spending around new product launch, and associated chargers, service centers, etc. ROI on those items comes over the lifespan of the new product that is launched. You’ve failed to account for the ROI, and you’ve failed to spread those costs across the units built from that investment. That is making the same type of mistake as the folks who said in the first months of Volt sales, erroneously said they cost GM $100,000 per Volt to build. They are making losses, real losses in cash flow and assets more broadly. Their liabilities are stacking up even if their customer deposits are excluded from the calculation. Even if their PPE jumped by 940m$ their cash balance dropped by 1.1B$ in the process, their accounts payable jumped by over 700m$ and their stockholder equity dropped by another 200m$. They would be horrifying, if it wasn’t perfectly clear that the situation will look very different already in Q3. Musk has said many times that they will be profitable and cash flow positive and do not require a capital raise. Every single time in the past it has been just smoke and mirrors where truth comes out just moments later when the actual data hits the public. Tesla is up around 20X since IPO. If you are just going long today, you’ve just admitted you’ve been wrong since IPO in NOT being long, and youve lost out on 20X returns!!! So forgive me when I say your opinion doesn’t matter, since you’ve just proven you’ve failed for 8 years straight to make the right call on TSLA, and should have been long the whole time. Why would we care about the opinion of someone getting the call wrong for 8 years? Tesla margins are different because their business model is different. Tesla owns their own sales and service. All other car makers do not, that is owned by other companies that own dealerships. Businesses get public funding. This is a reality for every large successful business. Don’t hate the player, hate the game. Why didnt you make your parents invest in BRK when you were a child. Thats the magnitude of interest I pay in your opinion. If you could predict each and every move in the equity market, there would be no need for the market to begin with. You are double counting the drop in total assets and the cash balance dropping. The drop in total assets by 0.75B because they have spent money on Model 3 launch and launch related spending. I’ve already covered this as spending on future ROI. Yes, they are spending money to launch a new product, and they won’t get the ROI on that product until they get enough sales. Duh. Are you the last person in the world to figure out that when you spend money to make money, the spending comes first, and the making money only comes after the sales happen? With what expense? Assets dropped by more than 700m$ and thats by your own link. You are making assumption that Tesla is committing fraud by not telling such development and accounting fraud related to the model 3? Are you sure know anything about accounting. Do you even know what 10-Q is? But you know all of this, you have had it explained to you many, many times before. You’ve been provided with links to the numbers. You blindly ignore it all, and come back the next story just to repeat all the same intentionally ignorant blathering. Or stay around and with every post you can justify Tesla’s decision to go private by displaying the wall of disingenuous intellectual dishonesty that has replaced financial analysis regarding TSLA from Tesla haters. You are just monkeys with keyboards yammering. So you are admitting that monkeys with keyboards yammering are STILL more accurate and factual than you are…. Yet of the two of you, he’s the only one that actually linked to Tesla’s financial data, while you just prattle on about how you think Tesla’s assets are appreciating and their burn isn’t an issue. Where’s your data? He provided his – where’s yours? 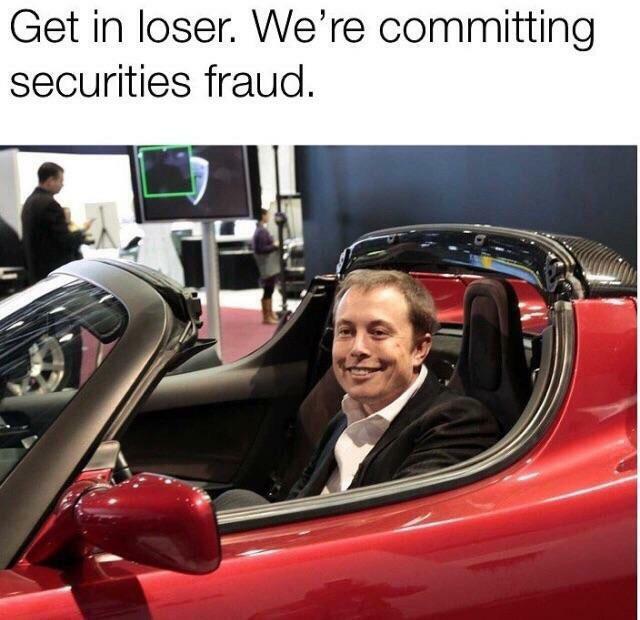 Oh yeah, and now Musk is under SEC investigation lol! He just can’t help but shoot himself in the foot, over and over and over again. It must be hard (and exhausting) to defend a guy like that – I bet you know how Sarah Sanders feels. I ask you, to explain what part of my post requires any explanation, Tesla explained it to us, they are making losses and they have documented the losses and provided the information for us. So what are those links and numbers you speak of? Is there any other more credible source than the legal disclosures from the company itself? It you can’t find the TSLA balance sheet on NASDAQ’s website, you’ve pretty much disqualified yourself. But I put the link above. Cant you find it yourself from Tesla? For the last 15 years “Tesla going bankrupt”. I love the smell of burning shorts in the morning. What does an SEC investigation smell like? Exactly. But there is nothing concrete to report on yet. It would simply be a story to generate clicks … like a tabloid story. We try to steer clear of those at IEV, even though they may pay the bills. We’re not about accelerating the opinion mill. He said, she said, what if, etc. I can see how being the most shorted company in history could mean that being publicly traded becomes a toxic way of funding business. If so much is invested in your demise it could become a self fulfilling prophesy at some point as the shorters and other disrupted industries will relentlessly target the financial market with FUD that might rub off on the consumer market at some point as well. So maybe going private is the way to go for a highly disruptive company that wants to act on a long term vision rather than react to the stock market interest in short term profits. The guy is crazy. Replace him with a new CEO and Tesla might become a success. I agree, Musk is ADHD not MBA, he is in trouble and he knows it. Johan and SJC, You’re both lunatics… Replace him so the company you pray to fail daily can succeed. So you’re suggesting a way for Tesla to be successful? How will that favour your short positions? Just go to hell with your comments. Elon is Tesla!!!! Elon Musk wants every dollar profit. Why give it to shorters in wallstreet. If i was him i’ll supply for a big big credit and buy all shares…420$ is good price. It begin in 24 dollars/share. Also with your enterprice profit you can pay credit every month and finally get the whole cake. In summary, you have 49% of the nation brainwashed into screaming “Drill baby drill” which logically manifests as a general dislike, among the brainwashed, for EVs, embodied by Tesla and Musk. Of course, this leads to an overemphasis on shorting Tesla stock, and a de-emphasis of Musk’s successes. Everyone becomes a little fearful of buying the stock, and the price is kept artificially low. But, that unnatural low price makes it a prime target for a buyout, which is essentially what is happening. Luckily the buyout is being orchestrated by the CEO. Once again Musk proves that he sees things clearly and not only sees the right path forward, but, and this is what is so great about the man, he actually goes down that path. As I said in the original story on this site about Tesla going private: Who will finance this and under what terms and conditions? If ever there were a case of “the devil is in the details”, this is it. I could easily imagine whoever writes this mammoth check being much more demanding of quarterly profits than Tesla’s current stockholders, for example. I just hope that the Tesla board and stockholders examine this process VERY closely, as there’s a good chance that Musk’s dislike of the requirements that go along with a publicly traded company will push him to making damn near any deal to take the company private. Are you thinking that someone who can write a $70 billion check is a short term trader? Sure, if it is someone who needs to take a big loan to cut the check, then there will be a need to quickly start paying it off. But, I think Musk is smart enough to chose financiers who are not just going to put the pressure back on, which would defeat his purpose. The people who would know on the Street say if he got the money from a traditional source – I-bank, PE – no one’s admitting to it. And given the size of his valuation, it would be nearly impossible for a traditional entity to write that check. So it’s begs the question: where did he get the guarantee? Because WSJ says the SEC wants to know, so he better actually have it, or he’s going to get charged. He’s such a nutcase – who would do something like this to themselves? Taking Tesla private will be a disaster. We all know how Musk’s last big acquisition worked out (SCTY). I certainly hope this will not happen. Name a single big private auto manufacturer, there is none for a reason. You are right…and it’s exactly why we had to count on a new automaker, not in big incumbent that are all entirely dependent on big stakeholders that are only interested in short time big profits, and so dividends, to invest massively in the EV technology to change the paradigm of all the auto industry, the same auto industry which choose to cheat on emission instead of this. The inertia of these incumbents would be far smaller to invest massively in EV after the demonstration made by Tesla that consumers are interested in EV, even expensive ones, if someone produces attractive and compelling ones, like Tesla does, it it was not for the short sighted view of their biggest stakeholders. But, it’s only now, more than 6 years after the advent of the Model S, that the big ones, will begin to offer other compelling EV. Porsche of 10 years ago was a very small company, comparing to Tesla. Tesla’s proposed purchase price is the same as ENTIRE VW group current valuation. Look another new username troll here to spread FUD. Get a real life you loser.